The only values we can reliably compare are the total installed capacity and those for nuclear as these are the only two which share a common baseline. Take a moment to study the growth of natural gas (red) in the early part of the chart, as the elevation for each bar is determined by the values below it we are forced to judge each segment individually before making comparisons between it and its neighbours. I recently came across some energy consumption data for the UK since 1970 and came up with an alternative method of display. The light grey bars are used to show the total energy consumption, and a breakdown of either the fuel type or sector are shown within. Crucially though all elements for comparison are shown along the same baseline which hopefully makes trends easier to follow. I did consider applying notes to this chart to highlight historical events that may have influenced the data, Thatchers election as prime minister in 1979 or the coal miners strike in 1984 for example. I don’t feel that my role is to provide all the answers though, just the facts in a digestible manner. I hope though that the well informed reader will make these connections themselves and as such will feel rewarded by their intelligence. 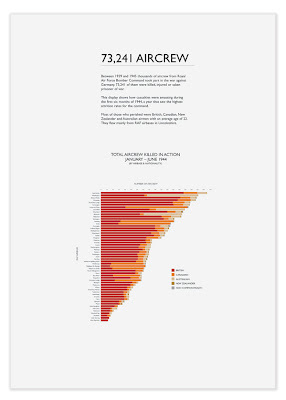 To read more about this visualisation click >here to visit The Guardian Datablog. The way you're trying to push the method to reveal comparative trends but also retain a sense of the parts making up the whole captures my attention. It's innovative and for me, in parts, quite successful. But I still think there's value in the traditional part to whole chart when used well. As we know the nominal comparison bar chart (every measure starting at zero) is a great choice for setting up comparisons. And conversely the part to whole relationship bar chart (or stacked as you say) is a good choice for very directly showing how the categories within a measure constitute the whole. Of course as you're saying, the latter method doesn't at all help us to compare the differing categories accurately when they are raised off the baseline, and your example illustrates this well. But I do believe that this isn't what the part to whole chart should be used for anyway. To my eyes, the part to whole method does make it fairly easy (depending on the number and combination of colours used!) to spot general trends between the parts, however inaccurate this may be – just at a glance. The method also gives a very accurate representation of the whole. I thought carefully about this in some research work I'm doing (pic below). I chose a ranked part to whole chart – ranked based on the whole value of a measure. Not very good if you want to accurately compare the categories of non British airmen I hear you say – and I agree. But good if you want to accurately show the whole and give an impression of trends between parts – whilst, importantly, introducing minimal visual interference. This work is leading me into an interactive version of the same vis – where I can retain the ranking of the measures but switch whatever parts I want to align to zero within the measures – so they are then registered at zero value thereby allowing direct comparison of the parts. The best of both worlds! But going back to the static vis – I think the approach you are taking is innovative because you're making a hybrid of part to whole and nominal comparison bar charts in a different way. One of it's pitfalls though is that the necessary proximity of measures can lead to a lot of visual noise – well at least for my tired old eyes!!! Also it's not really possible to match the constituent parts to the corresponding whole line above – although that problem would be easier to fix. It's also worth mentioning that one of the bitching aspects of the part to whole method is in cases where a measure includes category parts that are really tiny in the graph and have differences that would only be meaningful if you could in some way zoom in. I can see elements of this in both your work and mine that aren't ideal. But this is great to see, and I'm looking forward to seeing more! This is enormously helpful and I will consider all of these points in my future efforts. I completely agree that there is value in the traditional method and that there is room for improvement in my solution. I feel the version you have produced works particularly well because you are not always dealing with tiny changes in a time series as I have. For example the ratio difference between Canadian casualties (orange) in your chart is often very obvious, whereas differences in my data from year to year is often quite subtle and becomes easily lost when positions start jumping around. To demonstrate I have reconfigured part of my visualisation to more closely resemble the traditional stacked bar method and shown it alongside the original for comparison (see image 2 above). While I feel the stacked version manages to successfully communicate the overall big trends (decreases in solid fuels and petroleum verses an increase in gas) I struggle to see the changes on a yearly level for anything other than solid fuels. Take gas (blue) from 2000 to 2005 for example, in my original version I clearly observe a steady year on year decline, perhaps a little unusual given the overall growth over the 40 year period. In the stacked version to the right I feel I must work much harder to see any changes at all as I am assessing both the top and bottom positions of each bar. The baselined aligned version also makes it much easier to specify specific point in time when one fuel overtakes another in terms of usage. Ask yourself the question ‘when did gas (blue) become more commonly used than solid fuels (black)?’ Using the stacked version on the right would probably require some kind of external measuring instrument, however when bars are more commonly aligned we can clearly see this switch happens mid way through the 1990s (1996 if you count the bars). The downside, as you point out, is the potential for visual noise when reading my original version. I would certainly be cautious about going over five subcategories as I have done so here, and even in this case I feel that we are having to work a little harder than we should to read some of the categories that are positioned towards the bottom, however a smarter colour pallet could go some way to help improve this. The issue of tiny segments not being clearly visible at screen resolution is something which needs some serious consideration in the design process in all visualisations. My favourite method of viewing this chart is on the iPad using the PDF version on my site which allows you to zoom with tremendous speed and accuracy while retaining all of the detail. Many thanks for all you thoughts on this, they will no doubt help me develop this method further.